M. 19 Nov 1676 at Kinspindie, Perth Ref. D. Ante Jun 1722 at Ref. Alexander Pitcairn, eldest son of William Pitcairn of that Ilk, succeeded his father in Forthar. Their estates of Pitcairn was now lost to the chiefs of the House of Pitcairn, as it had been sold by William Pitcairn of that Ilk, in 1650, to John Pitcairn of Unstoun, his uncle. Alexander of that Ilk married, 1665, Margaret, eldest daughter of Sir Patrick Threipland, Baronet, of Fingask, and his wife Euphame, daughter of John Conqueror of Friarton. Alexander Pitcairn of Forthar died ante June 1722, for in the Falkland Registers it says, on that date Mrs Margaret Pitcairn , lawful daughter to the deceased Alexander Pitcairn of Forthar, and John Coll, Falkland, now in the Collidge Church paroch in Edinburgh, gave up their names for proclamation. 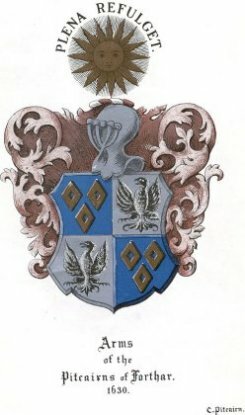 The nephew of Margaret Pitcairn (nee Threipland) and granson of Sir Patrick Threipland was Dr Stewart Threipland, who afterward became Sir Stewart Threipland, third Baronet of Fingask. The estate of Fingask had been forfeited in the Jacobite rising of 1715, also the estate of Pitcairn. Sir Stuart bought back Fingask from the creditors of the York Building Company, who had bought the forfeited estate in 1720, and a friend of the Pitcairn family bought back Pitcairn for them at the same time.